A Motor Vehicle Bill of Sale is a document that helps in recording a transaction between two parties, known as a buyer and a seller. Through this Motor Vehicle Bill of Sale, the seller can get information of the date on which the vehicle was sold and also can retrieve the buyer’s information. It is equally important for the buyer as he can use this Motor Vehicle Bill of Sale as a proof and can use it if any dispute arises in future. If you are looking for Motor Vehicle Bill of Sale Forms, the forms as mentioned in the below post will be an ideal start for you. Blank Motor Vehicle Bill of Sale is a perfect bill of sale sample, and it includes various relevant fields like date and time of transaction, transaction amount, details of both the buyer and seller followed by their signature at the bottom of the form. You can also check the Free Bill of Sale Sample Form. This Generic Motorcycle Bill of Sale is a perfect fit for all types of vehicle sales. You can use it to outline the information about the vehicle you are about to sell. 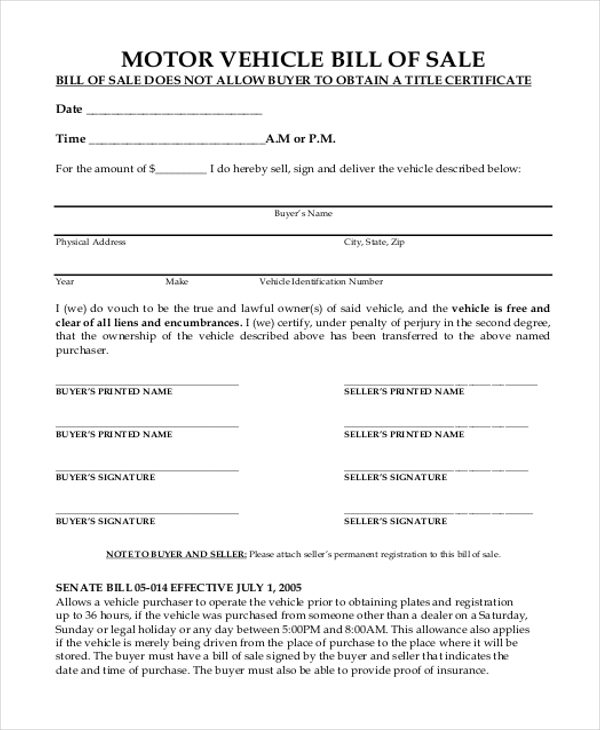 Both the buyer and the seller need to sign it to make it authentic.You can also see Motorcycle Bill of Sale Forms. 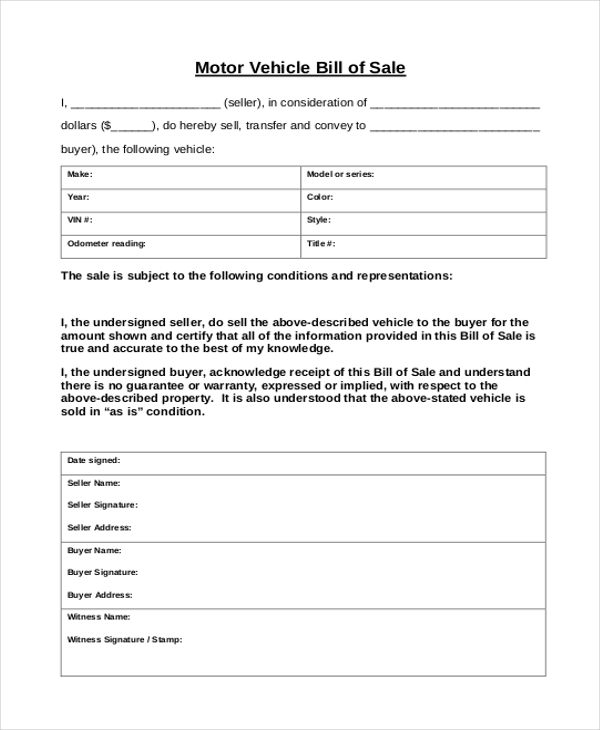 Bill of Sale for a Motor Vehicle Example is available in a ready to use format, and you can use this form after making the necessary customization. 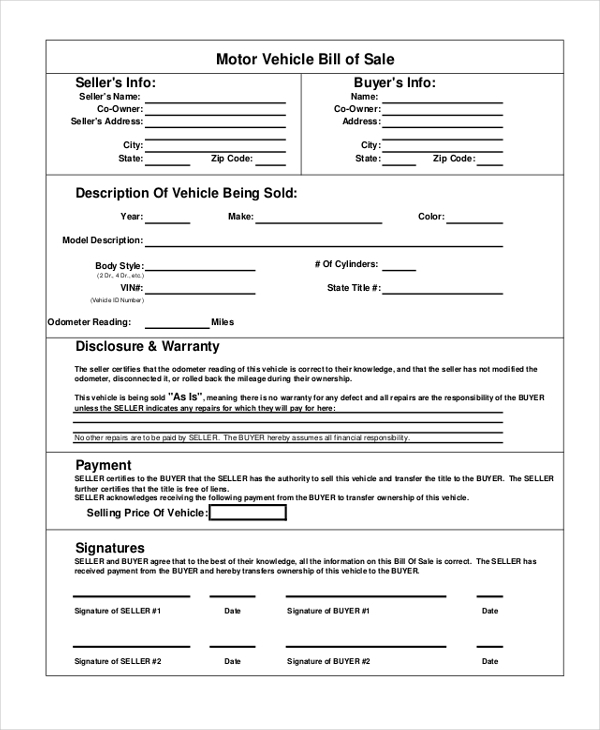 Download the form sample; customize it, print the document, and you can use it as your primary vehicle bill of sale. Free Motor Vehicle Bill of Sale is a document that contains the details the details like name, address, of both the buyer and the seller. It also includes the make of the vehicle, date and time of sale, followed by both party’s signature. 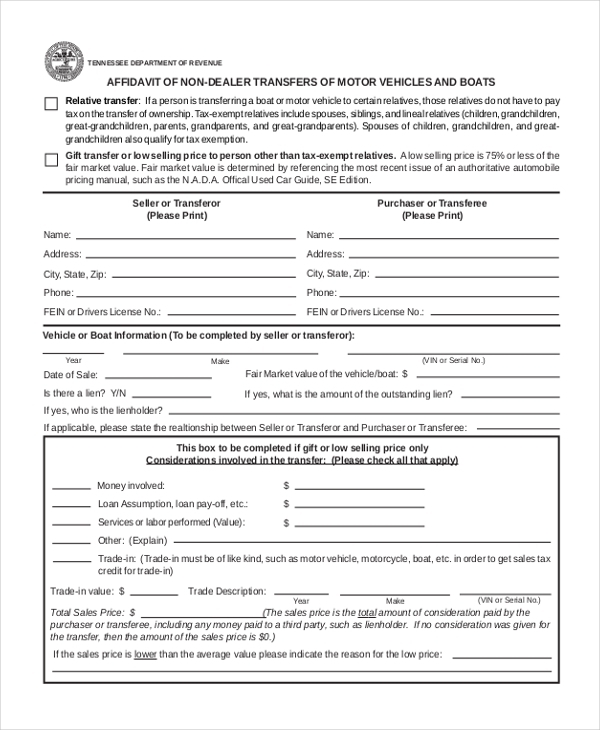 You may also see Bill of Sale Forms For Vehicle. 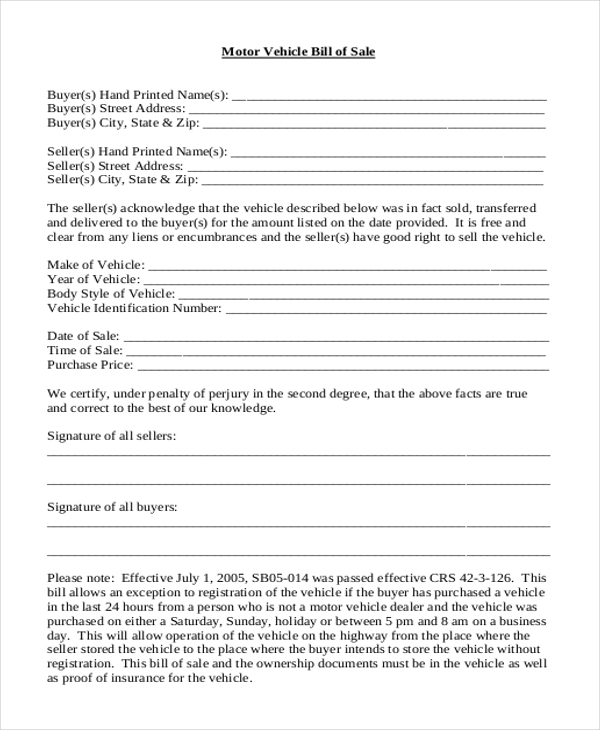 This Sample Motor Vehicle Bill of Sale is presented in the form of paragraphs. The information about the seller and details about the vehicle are mentioned at the top. You can also see the various clauses of the transaction in this bill of sale form. Downloadable Motor Vehicle Bill of Sale will save you a lot of time as you don’t have to create one from scratch. Download this sample, insert in the important details, and you will be ready with your bill of sale. You can also see Sample Vehicle Bill of Sales Form. 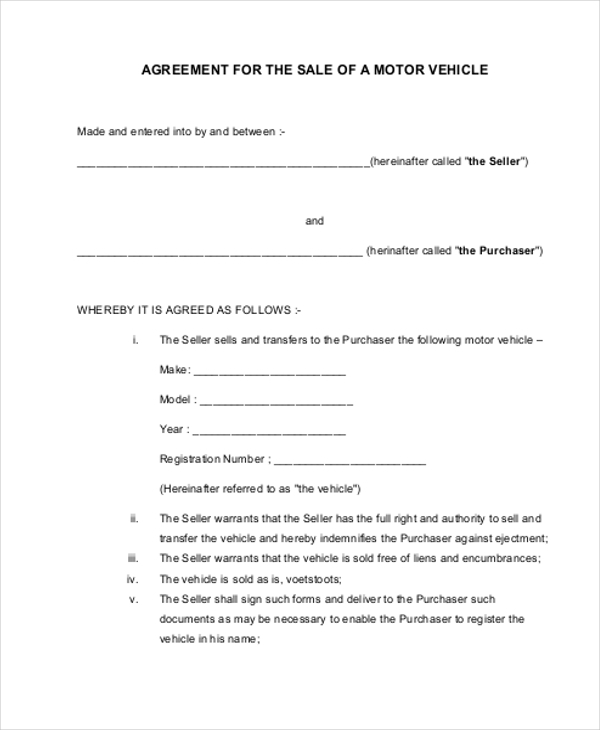 Agreement For The Sale of A Motor Vehicle starts off with the details of both the buyer and the seller, followed by the various terms of the transaction. Use this sample to create your bill of sale. You can also check the Car Bill of Sale Forms. 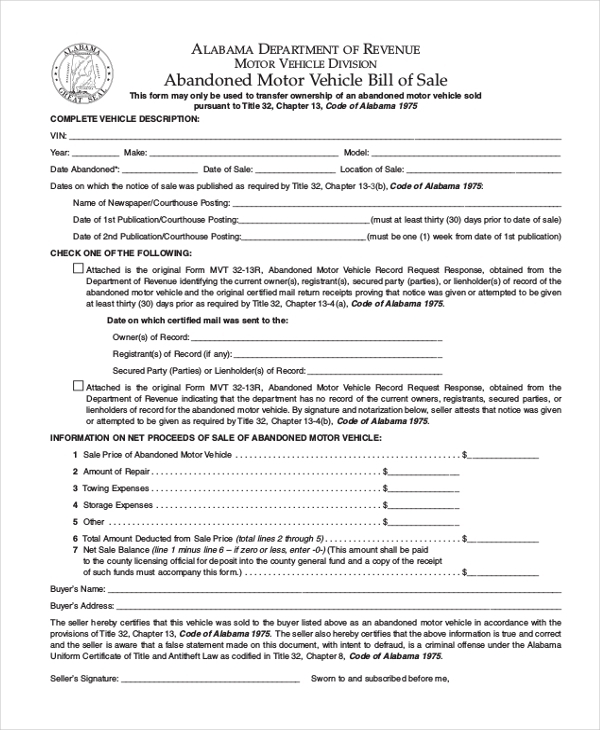 Abandoned Motor Vehicle Bill of Sale can be used by those individuals who owns a vehicle but they are not using it, but the vehicle is in good condition. Such individuals can use this Abandoned Motor Vehicle Bill of Sale form to attract prospect buyers. 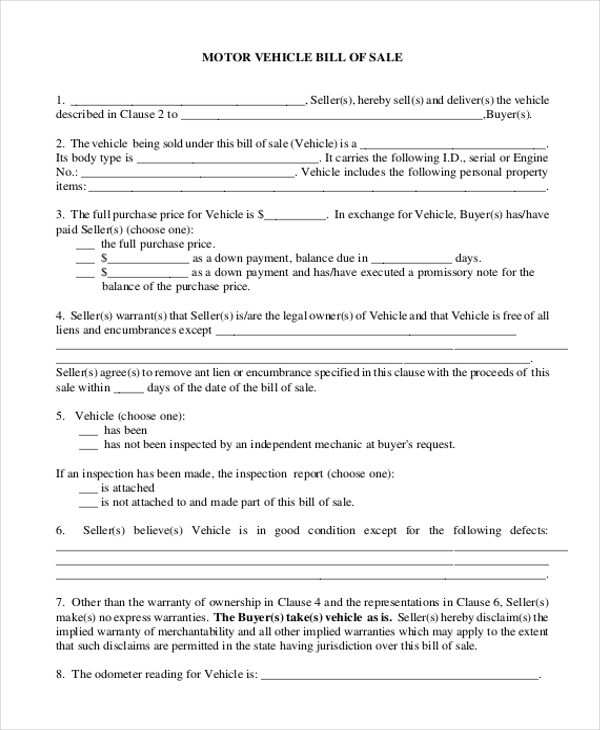 While using this Affidavit of Transfer of Motor Vehicle, the buyer and seller need to mention the relationship between them because if the transaction happens between relatives, the relatives don’t have to pay tax on the transfer of ownership. Why is The Motor Vehicle Bill of Sale so Important? 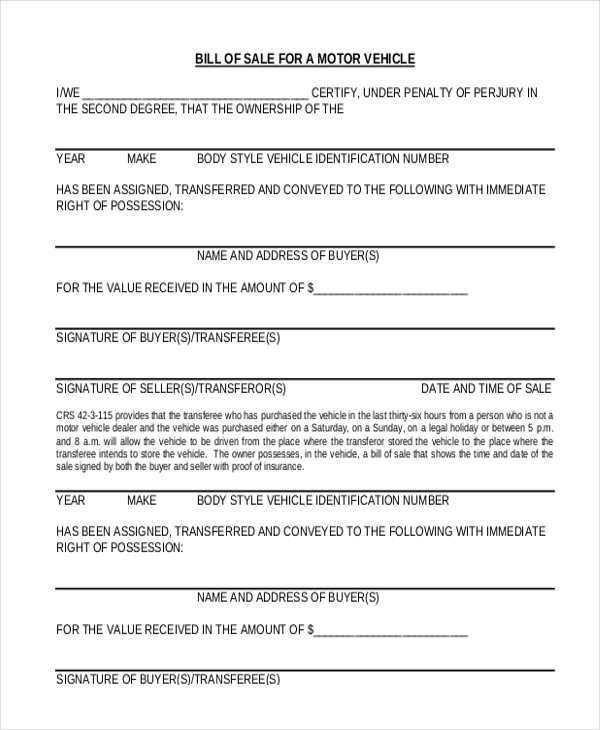 The bill of sale is the document that indicates that the vehicle has been transferred regarding ownership from the previous owner to the buyer. This is very crucial as particular vehicles may have pending traffic rule violation cases or accident cases against it. Without a proper bill of sale, the buyer may land up in trouble unknowingly. The bill of sale acts as a written document between the buyer and the seller regarding the transfer of ownership. It is important for both the parties as a lot of legal obligations come as part and parcel of vehicle ownership. You may also see Bill of Sale in PDF. What Information Should You Include in this Bill of Sale Document? All possible details of the vehicle, the names and contact information of the buyer and seller must be included in the Bill of Sale document. Apart from this, you should also contain information on the vehicle manufacturer, model, mileage, and the technical condition of the vehicle. If there are any clauses of warranty on the parts of the vehicle, it should be specifically mentioned in the bill of sale document. The bill of sale identification number should also be included as each vehicle has a unique identification number. Other important details that you must include in the bill of sale document are, the transaction date and time, transaction amount and term of payment. You can also see Bill of Lading Forms. The bill of sale is a very critical document for both the buyer and seller. You can go through our extensive collection of Motor Vehicle Bill of Sale form sample and select the one that matches your requirement the best. You can even customize the document as per your need.